We had fun exploring apples last week. I went around and found as many different kinds of apples as I could. I was a bit disappointed not to have found any yellow apples. We started by discussing the parts of an apple. I used this printable and we worked on it together as I let the Lil Divas explore the different parts (minus the leaf because none of my apples had one). I cut some apples in different ways and they were excited to how different they looked. The Lil Divas especially liked seeing the star and counting out the seeds. Then we went on to our Taste Test. I made a simple chart of the different apples we had and the Lil Divas kept track of their color, if they found them sweet or sour tasting and if they liked them or not. The Lil Divas only had 1 apple they did not like - the one they found sour tasting. Interestingly, it is actually one of my fave apples - the Granny Smith apple. 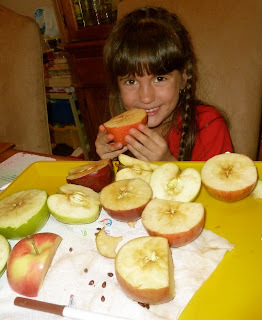 Then, I let the Lil Divas do some apple stamping with the various cut apples using red, green and yellow paint. Be sure to check out our other Apple Themed Fun! Can you make the apple chart available to print? That is cute! My son did some apple stamping at Mother's Day Out last week. I should do the taste test with him next. I'd like to do that for myself! This post reminded me that I forgot to mention our apple tasting in my post. We just did apples too, because of reading How to Make an Apple Pie and See the World for FIAR. We are continuing this week, so I guess I will mention it in the next post. Thanks for sharing the link to the parts of an apple printable. That will be great for our apple book. Oooh I never thought of getting lots of different apples together and tasting them all with the kids. How fun... I bet they would love the experiment! Thank you, again, for joining in at Kids Get Crafty! We did an apple tasting too. I should have had JDaniel paint with the apples he didn't like. I love the parts of an apple printable. What a fun way to learn about apples. We haven't tried a taste test here yet, but it sounds like fun! This is such a great activity, I love this!